And how these popular products could be putting your portfolio in danger! Over the past five years alone, ETFs have more than doubled in size to nearly $3 trillion. By 2021, that number is expected to hit somewhere between $7 and $10 trillion. Yet most investors don’t realize that ETFs can be extremely complex, full of hidden fees and tax implications, and potentially dangerous if used incorrectly. The truth is, if you’ve been told all ETFs are safe, you’ve been misled. Most investors just don’t know enough about how ETFs actually work to make smart investment decisions. And just like any investment... if you don’t know what you’re buying, you could be setting yourself up for disaster. Which is why we asked Jared Dillian—author of the critically acclaimed book Street Freak: A Memoir of Money and Madness and former head of ETF trading at Lehman Brothers—to host this special ETF Master Class. Why most investors lose money with leveraged ETFs—Have you seen ETFs that claim to deliver 2x or 3x returns... and wondered if you should be using them to juice your profits? You’ll learn the dirty truth about these products, and why it’s so easy to lose money using them. If the market crashes, what happens to ETF liquidity?—Worried about another “flash crash”... and what might happen to your investments if the market suddenly drops? Here’s what you really need to know about ETF liquidity, and how to protect yourself from getting trapped in a fund you can’t get out of. How commodity ETFs are stealing money out of investors’ portfolios—It all has to do with how these funds are constructed (hint: they don’t track commodity prices, but this instead). The greatest transfer of wealth from retail investors to institutional investors EVER—It happens every single day because retail investors don’t understand how this common, but dangerous, ETF product works. You’ll learn exactly what it is, and how to avoid using it. The Hidden Danger in Swaps—What they are, how to spot them in an ETF, and why you should think twice about investing in ETFs that hold them. Should you use mutual funds or ETFs?—If they both track the same index, which one should you use? Here’s what you need to know before you invest. 4 ETF trading strategies—Interested in short-term investing or day trading? You’ll get the four “must know” strategies every trader needs to master. Is it better to use options or ETFs when short selling? Want to go short, but not sure if you should use options or an inverse ETF? All you need to do is answer this one question. The money-making secret hedge funds and institutional traders use when this happens to index funds... and how you can use it to your advantage. What happens behind the scenes when ETFs are traded... and the hidden implications for individual investors. How even inexperienced investors could beat 80% of actively managed funds with this simple strategy. Jared originally filmed the ETF Master Class in front of a live audience in New York City. 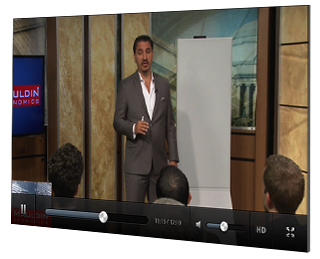 When you sign up for this course, you’ll get immediate access to all the recordings from this event. The course has been split up into four modules. Before Jared dives deep into how ETFs work, it’s important that we start by covering some fundamental concepts related to indexes and index investing. In this module... Jared talks about what an index is, the different ways index funds are weighted, active vs. passive investing, and the pros and cons of using index funds. Right now, ETFs are hands down the fastest-growing investment product on the market. Today, there’s more than 6,000 ETFs around the world to choose from... and many of these products are complex and potentially dangerous if used incorrectly. Which is why it’s so important that you understand exactly how these products work. In this module... Jared covers the three types of index funds, the nuts and bolts of how ETFs are created, liquidity issues, different ways you can invest using ETFs, and more. Have you ever wondered what happens behind the scenes when you click the “buy” button in your brokerage account? In this module, Jared talks about the evolution of how securities are bought and sold, how markets are made, leveraged and inverse ETFs, and the impact technology has had on how ETFs are traded today. In the final module, Jared covers the exotic, unique, and what we might call “the fun stuff.” Derivatives, swaps, volatility ETFs, and short selling are all discussed. When we decided to launch the ETF Master Class, we knew we wanted to create the best training course on the market. So, we asked 10th Man readers to send us any and all questions they had about ETFs. We received more than 800 questions… from individual investors and seasoned financial professionals… and decided the best way to answer them was to host a live Q&A call with Jared. Our team looked over every single question that was submitted and picked out the top 10 questions to answer. Is there an ETF rating service I can use to find good ETFs? What are your thoughts on building an ETF portfolio and various ETF trading strategies like market timing and sector rotation? What are the risks of ETFs becoming an overcrowded trade and subsequently creating liquidity issues? What regulations exist to protect investors from market distortions potentially created by ETFs? What happens to ETFs during a market correction or financial meltdown? Am I at risk if an ETF company goes bankrupt? Why should I choose an ETF over individually selected stocks, and under what conditions should I do this? Jared also took a few more questions asked by our attendees on the call… including a very interesting one about commodity ETFs, and how to potentially avoid the “roll down” with this trading strategy. When you enroll in Jared’s ETF Master Class, you’ll get access to the recording of this call. But what he can do is break down the mechanics of how these trading strategies actually work, explain how he decides when to use these types of strategies, and show some of his previous trades (winners and losers) to give you some real-life examples. While Jared can’t give you personalized investment advice… he can teach you “how to fish” by giving you the important information you need in order to properly assess what you’re buying before you buy it. A lot of very valuable information is inside the prospectus, but most investors never bother to read the prospectus of the funds they buy. That’s because most of them can be a bit intimidating. Which is why Jared is going to walk you through the exact process he goes through when analyzing a fund and determining how the product actually works. Not only will you have a much better understanding of how ETFs work as a product … but you’ll understand how investment products work in general and what the implications of the “fine print” mean for you as an investor. If you’re an industry professional, you can get CFA and CIMA continuing education credits for taking Jared’s class. Personally, I think this is a complete no-brainer at $199. You’ll have access to the recording of the live Q&A call I hosted with Jared Dillian, where we answered dozens of questions our 10th Man readers sent in. And you’ll have access to all the extra bonus content we create based on your feedback. Also... if you’re an industry professional, you’ll be able to get CIMA and CFA continuing education credits for taking the course. To get instant access to the ETF Master Class—and all the bonuses—all you need to do is click the button below. You’ll be taken to a secure order form at the bottom of this page where you can enter your payment information. If you aren’t convinced this is the best $199 you’ve invested in your education, we don’t want your money. Here at Mauldin Economics, we’re committed to only offering the highest-quality products. So, if you don’t think we delivered on that promise, you can request a full refund at any time during the next 90 days. ETFs are only going to increase in popularity. You can’t afford to NOT know how they work. Which is why I’m doing everything I can to take all the risk out of taking this course and give you every opportunity to properly educate yourself about how these investment vehicles work. To get instant access to Jared Dillian’s ETF Master Class, all you need to do is fill out the secure order form below and click the “Submit Order” button. IMCA® has accepted Jared Dillian's ETF Master Class for 2 hours of CE credit towards the CIMA®, CIMC®, and CPWA® certifications.